I meant to post this the other day for Earth Day, or better yet, a few weeks ago after Earth Hour at the end of March. Of course, everyone turned out their lights at the allotted time then, so the planet has been rescued and we can all breathe a sigh of relief as we all get back in our cars and switch our screens on again…. Excuse the sarcasm. I just don’t get Earth Day. Isn’t every day Earth Day? It’s not like we go anywhere else often, is it? I am on a bit of a Green coffee kick nowadays, however. I don’t mean Green coffee as in, raw coffee, although I do have some large sacks of that in the basement at the moment. Nor do I mean the likes of Nescafe Green Blend. Despite that still being the most commented on post on this blog, I haven’t actually seen many anti-oxident filled, weight-loss marketed, gimicky and green-washed coffee products in quite a while. Maybe they haven’t reached Canada yet. This is a very good thing. What I mean this time, is environmentally-friendly coffee, if that isn’t an oxymoron. I’ve already written a great deal about organic and/or sustainably produced coffee, and there are very many issues with it. In brief, organic coffee is far more difficult and more risky for impoverished farmers to grow – sometimes is it not worth the investment of time, labour and resources to grow a crop that may well be eaten by pests before it can be harvested. Then there are the high-end buyers who refuse to buy organic coffee under the impression that using chemical fertilizers optimises the quality of the beans…. Of course, the farmer-friendly alternative involves cutting down the cloudforests and destroying the biodiversity in the tropics, just to grow a cash crop. In summary then, it is very very difficult to grown coffee in an environmentally-friendly way. But given that millions of people’s livelihoods depend on those crops, can we not just consume it better? I am trying to do my bit. My last post was ranting and raving about how wasteful Keurig k-cups and other coffee pods are. Getting rid of them would be a start. 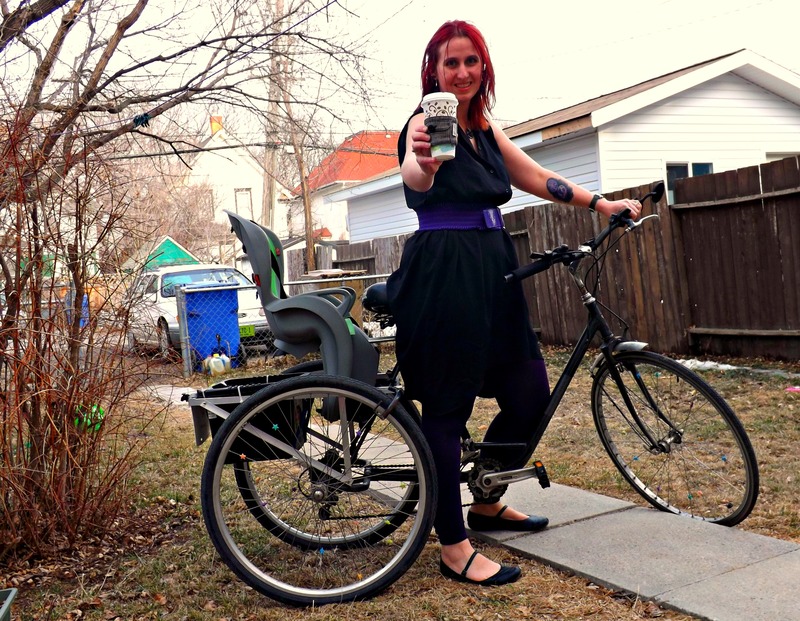 I am soon going to launch the first ‘green’, trike-drawn coffee cart in Regina (not actually green, more, PURPLE) – it’ll be the only food truck downtown that doesn’t have an engine too. I am also selling reusable travel mugs, and CupCuffs – very stylish, reusable sleeves for your takeaway coffees that don’t involve cutting down trees to make cardboard disposable ones. (FYI, they’re made in Canada too, not sewn by small Korean children and shipped around the world). Mainly because it highlights the devastation in my beloved Nicaragua. I can as flippant as I like about Earth Hour and associated first-world hand-wringing, but this – this is serious. Simple really: pay more for it, or lose it. Paying a higher price for coffee won’t cure climate change, but it will certainly help the farmers cope with that climate change better. Or, start learning to love Robusta coffee that is more resilient to climate change and disease – and tastes far worse. I’m sure I recognise a few people here.